by Rob - July 23rd, 2016. Filed under: Anniversaries, Star Trek. 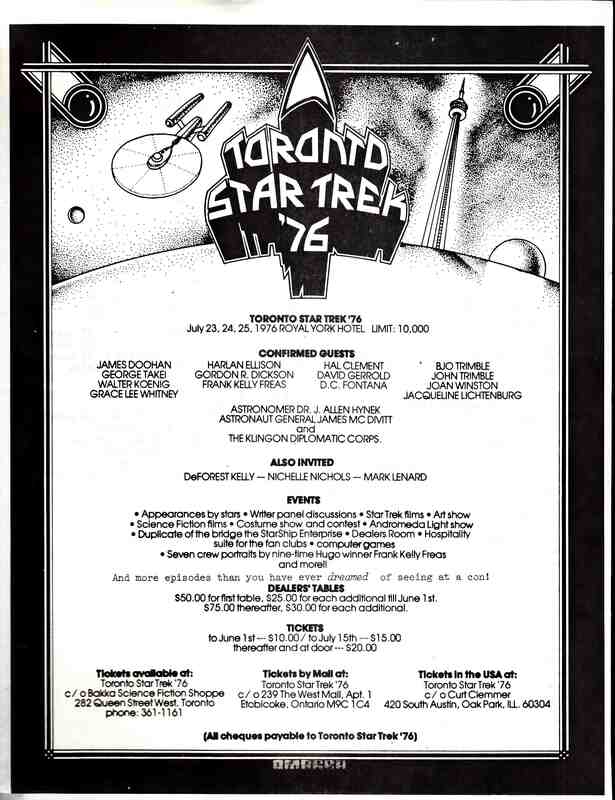 Forty years ago today, the fabulous fan-run convention TORONTO STAR TREK ’76 began at the Royal York Hotel. Here’s one of the flyers for the con (Nichelle Nichols and Mark Lenard, listed as only “invited” on this flyer, actually did come — as did the entire cast, except for Shatner, Nimoy, and Kelley). One of the most amazing weekends of my life (I was 16), and, even now, hundreds of conventions in, it’s still one of the best cons I’ve ever attended. Had so much fun spending the weekend there with friends Carolyn Clink, Gillian Clinton, Ted Bleaney, Lynn Conway, Steve Scott, and my late bestie Gary Mackenzie. Incredible to think, 40 years later, it’s the debut weekend for the 13th Star Trek feature film, and the sixth Star Trek live-action TV series is now in production … here in Toronto.